Bug Spray – 2 fl. oz. & 8 fl. oz. Filtered Fluoride-Free Water, Vanilla Extract*, Neem Oil* (15% olive oil*), Vegetable Glycerin**. Essential Oils: Tea Tree* & Geranium*. Bugs buggin’ you? Not anymore! 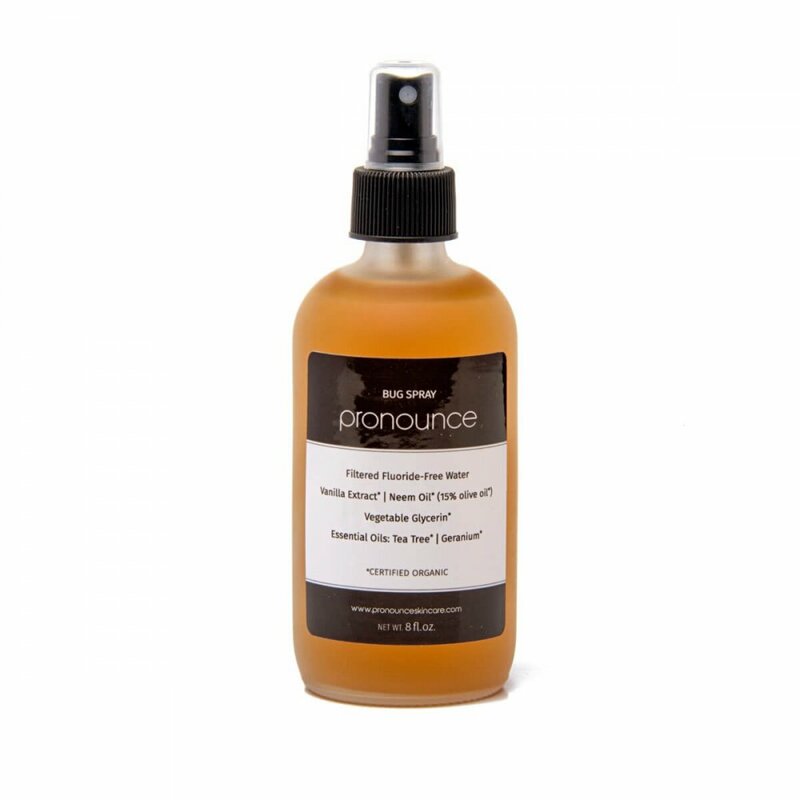 Pronounce Skincare Bug Spray is truly NON-TOXIC, contains organic ingredients, and is an EFFECTIVE bug repellent solution! 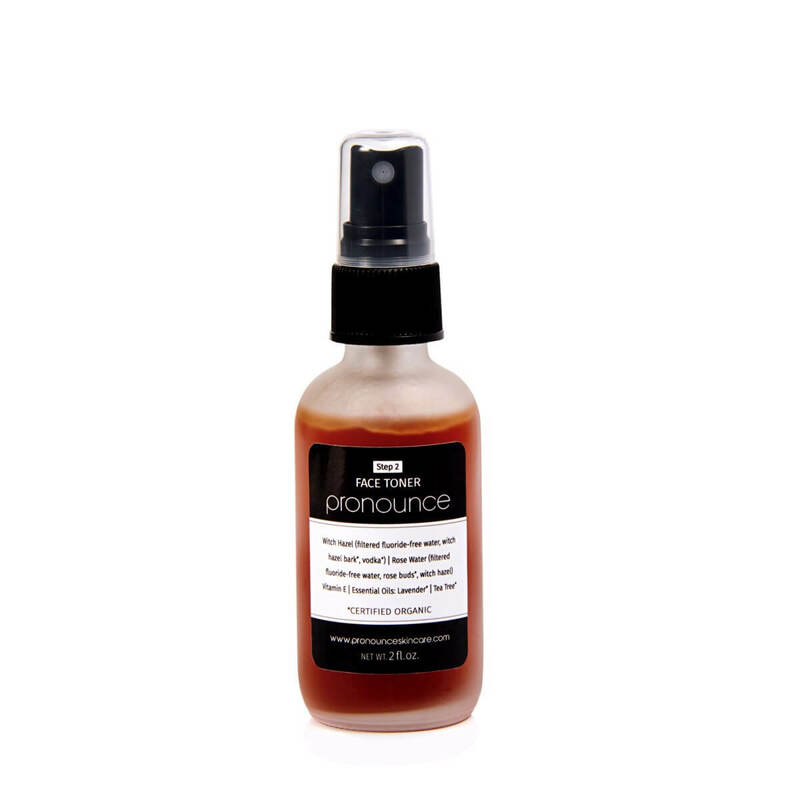 Pronounce Bug Spray smells great and also serves the main purpose of keeping mosquitoes and other buggers at bay, all while being non-toxic and healthy. You simply shake your bottle, spray it on your clothing and any exposed skin, head outside, and enjoy the great outdoors. 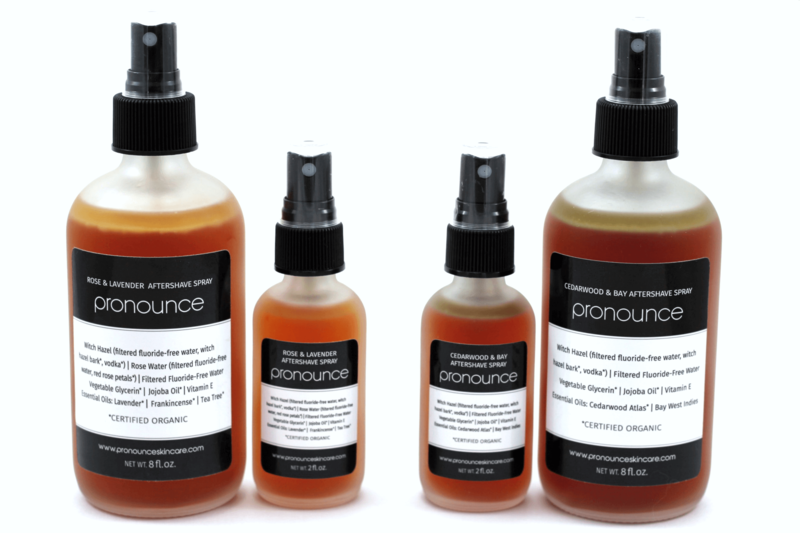 The ingredients used in Pronounce Skincare Bug Spray are highly effective for fighting off pesky bugs. Tea Tree Oil has antimicrobial, antibiotic, and anti-inflammatory properties. Not only is it healthy and healing (in appropriate doses) for humans, it is *strongly* disliked by many insects. Geranium Oil has strong wound healing properties and holds many of the same properties as Tea Tree Oil, but it is also hailed for its ability to keep insects (especially mosquitoes) away. Neem Oil has an impressive, well-researched track record of not only being incredibly moisturizing and healthy for all skin types, but also for repelling biting and stinging insects. Vanilla Extract– Those annoying, buzzing, tiny flies? Yeah, they loathe vanilla. Perrrrfect! 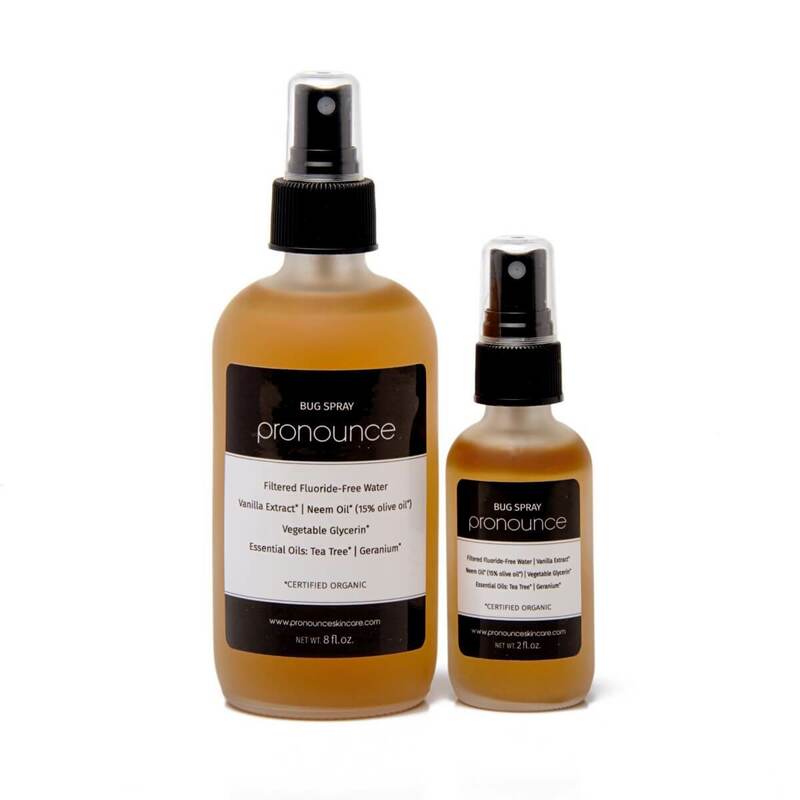 You will not be disappointed with Pronounce Bug Spray. Order a beautiful frosted glass spray bottle today and within a few days you’ll be sitting outside enjoying your evenings and not constantly swatting away bugs that land on your skin. Get back your outside time…don’t let those annoying bugs have it! 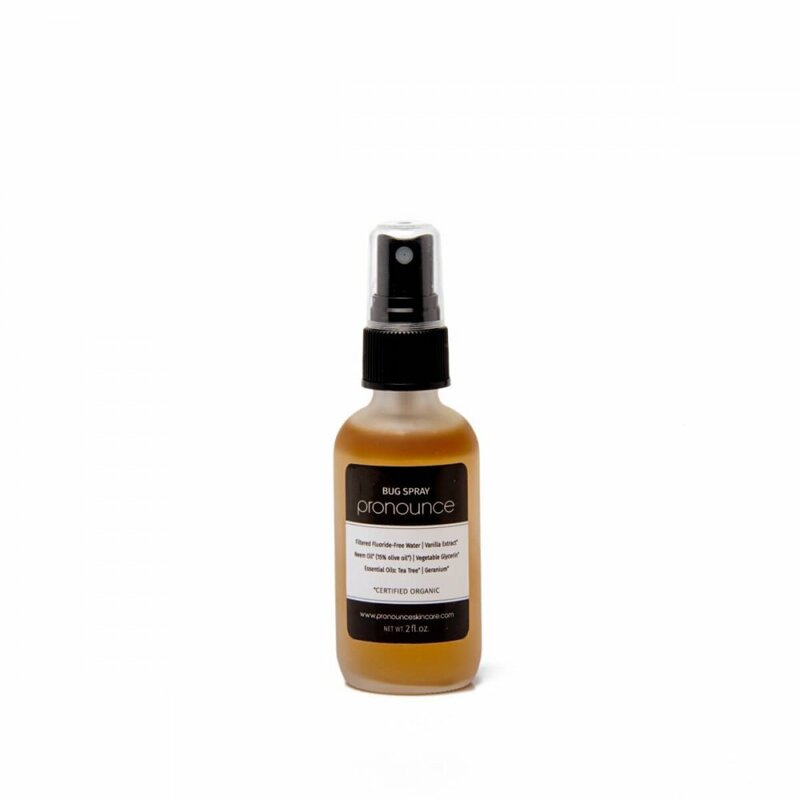 While you’re outside, don’t forget your non-toxic, non-nano SkinShade sun protection! Bugs love me…it’s the worst! Although this bug spray wasn’t able to keep them away 100% it was just as good, if not better than any of the others I’ve tried. The best part….no chemicals and it smells good. Like, actually good. I’m getting low and am ready to order another bottle for my next trip to the tropics! Bugs loving you is the worst! I’m so glad that my non-toxic bug spray is keeping them at bay, and that you love the smell! My husband is on the soccer field constantly, with the bug bits to match – UNTIL NOW! No more chiggers, no more mosquitoes. You’ve made his soccer life MUCH more comfortable!! Thank you! Fantastic! Who needs that icky, toxic deet stuff!? No more of that…yay! Nice to use something that doesn’t hurt me physically. Works great!! My family and I have been using this Bug Spray for a few years now and it hasn’t failed us yet! I usually get mosquito bites no matter how much store bought/chemical laden spray I use, but since I’ve been using this bug spray I can actually go outside in the summer and not get eaten alive! I can’t say enough good things about this spray! I was sitting outside a few nights ago and bugs were driving me crazy. I remembered I had this and decided to give it a try. All I can say is no more bugs. It’s awesome. I love, love, love this product!!! I live in Alaska, and as some of you may have heard that we have some enormous mosquitoes up here and it’s no lie … we call them B52 Bombers! We also have those annoying no-seeum gnats (which I HATE!!!!) that are just viscous. And I am just one of those people that these bugs just LOVE …. grrrr ….. so needless to say I just get eaten alive if I don’t have any protection. I used to literally bathe in that chemical filled repellent before heading outside in the summer to do anything, so much so that I used to have to take a shower every night before bed because I could smell it on my skin and I just felt sticky. When I found this product, I thought sure why not give it a try and boy am I glad I did! I love this product and it actually works at keeping these little buggers away from me! It feels amazing on my skin and smells GREAT – love the hint of vanilla! My husband even doesn’t mine the smell and the first night I had tried it I didn’t feel the need to shower it off and he commented that I smelled great and asked it I had a new lotion! Haha! Now if that’s not proof in the pudding I don’t know what is! Thank you again for another great product! P.S. Works great on dogs and horses too! No more toxic chemicals being applied to them so close to their eyes and nose – yay!! No bug bites or stings even in the humid, hot nights. Really like this bug spray. Mosquitos love me but not anymore since I’ve been using this great-smelling spray. I’m usually that person that gets eaten up by mosquitoes even with traditional bug spray and citronella candles nearby, so I’m always on the hunt for a good, effective solution. I’ve finally found it! I bought this spray specifically for a trip to Mexico and it worked great! My friends on the trip were using a bunch of traditional bug sprays and were still getting bites, whereas I used this spray and was fully protected. In fact, the only time I did get bitten was when I had forgotten to put it on. It has a nice, earthy smell and absorbs pretty quickly, so those are added perks as well. I appreciate that there is a 2 oz option so that it’s convenient for travel. Wonderful all natural bug spray. WOrks great. I bought bottles for people in my family with sensitive skin – EVERYONE loves it. Thanks! I absolutely LOVE this product. The scent is light and GOOD. Bug spray that makes you smell good?! Amazing. Thank you for creating a bug spray that WORKS, smells great, and I feel good putting it on my family! Love it! Works and smells good! This is honestly the best bug spray we have ever used! Works so well! It works and smells great!! Does not feel like any bug spray I have used before. This smells nice, and actually keeps bugs away. While I’ve always been one of the lucky ones who isn’t pestered much by bugs, my husband was never so fortunate. He swears by this stuff now! We’ve been buying it for a couple of years now and there is nothing better. This is the best bug spray I have ever used!! Love the glass bottle it comes in but, most of all love the spray itself. It does not feel nor smell like you are wearing bug spray at all! scent is wonderful and not overpowering to my sensitive nose. will continue buying this from now on. Thank you for shipping it out in time for our camping trip!! I LOVE this spray! I am keeping it on my kitchen bar for easy use anytime we go out. We were trying to have dinner on the porch one evening this week and it was just too”buggy” but I sprayed both my girls (4 and 2) and went back out and I honestly didn’t see another bug! The smell isn’t offensive either! Awesome stuff! Put it on last night at a BBQ on our deck, and didn’t get bit once. As a person who gets eaten alive every evening, I’m super thrilled! It works!!! I live in Wisconsin & I’m either living in the woods (on my deck) or on a lake. Best bug free summer I’ve had in decades. I love the bottle it came in, too. It’ll be very easy to re-use, and a lot better than plastic storage. I was skeptical of this at first… but these ingredients together really do keep those pesky bugs away at night. It smells amazing; my (2.5 y/o) daughter actually thinks its perfume! No bug bites for us this summer! OMG! This is just the best!!!!! It really does work!!!!! Love the scent, it works great and holds up even on those hot & humid days! Great product and fast shipping! Produce was great, but best of all was the seller, easy to work with and very pleasant. FABULOUS product! I even use it on my chickens! It helps keep the pesky mosquitoes off of them at night! HIGHLY, HIGHLY RECOMMEND!!! the bottles are beautiful and glass is the perfect size, and the spray smells so good that i get compliments on my ‘perfume.’ plus, this spray works! it has kept bugs off me, which is great because i garden and am usually a bug magnet! i cannot recommend this product highly enough. perfect 10. Very effective and worth every penny.! Thank you!! I purchased with my four year old daughter in mind, she is one that gets eaten up with bugs when no one else does. We love to play outside and her legs looked horrible from bug bites. I have been applying this lotion at least to her legs for about a week if i know we are going to be playing outside at all and we have back to normal legs! Very impressed with this product and the odor is not offensive! Yesterday I received my brand new jar of Scrotch Mommy Bug Be Gone Lotion. For quite some time I have had a problem with knats (or some kind of flying bug) that has snuck inside my home, annoying me around my face while sitting down watching TV, cooking in the kitchen, etc. I quickly applied the lotion and almost instantly, it started repelling those pesty little flying bugs away from my face, and also my feet. Thank you for such a wonderful product! Will continue to do business with you.